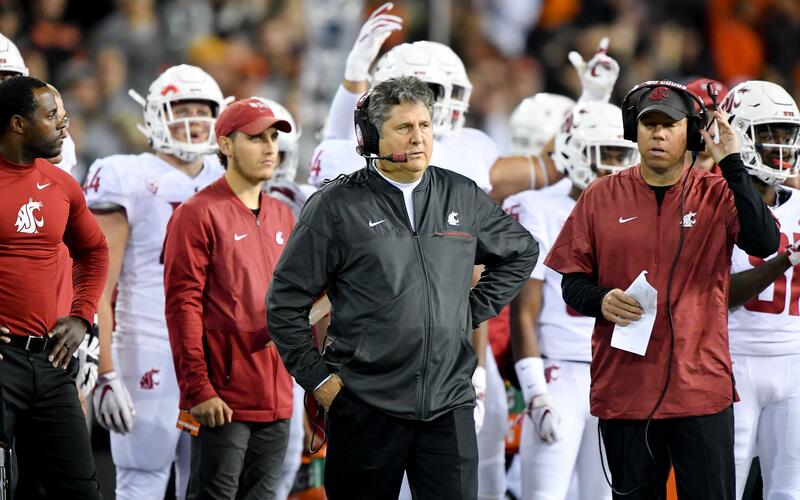 SAN ANTONIO, Texas – In between the dozens of phone calls they’ve made to recruits over the last three weeks in preparation for the early signing period, Washington State coaches have found time to sprinkle in a few other calls. Some of those to Morgantown, West Virginia, others to Norman, Oklahoma, and presumably a few more to Lubbock, Texas. Washington State’s connections to the Big 12 Conference have finally come in handy. “It’s funny, a few of us have got our buddies in the Big 12 who are trying to help us out with Iowa State, who’s really good on defense,” inside receivers coach Dave Nichol told Cougars broadcaster Matt Chazanow last week. The Cougars can gather most of what they need to know about Iowa State, their opponent in Friday’s Alamo Bowl (6 p.m. PT, ESPN), by watching film on the Cyclones, who earned the second straight postseason bid under coach Matt Campbell after going 8-4 overall and 6-3 in conference play. But if the Cougars need any additional intel, they have more than a few friends around the Big 12 willing to help out. “Shoot, you look at the Big 12, there’s just connections all over the conference with people that have coached for coach (Mike) Leach,” Nichol said Tuesday after the Cougars wrapped up their second practice at Gayle and Benson Stadium on the campus of Incarnate Word. Nichol estimate that “about half those guys” have given WSU information on the Cyclones, or answered a question based on a tendency the Cougars noticed while studying film. Three of ISU’s nine Big 12 games were played against schools coached by somebody who was employed by Leach during his 10-year run at Texas Tech. Oklahoma’s Lincoln Riley, a former Texas Tech quarterback, held a variety of positions on Leach’s staff in Lubbock between 2003-09. West Virginia’s Dana Holgorsen played for the WSU coach at Iowa Wesleyan in 1991, then reunited with Leach at Valdosta State in 1993 and eventually joined him at Tech for eight seasons from 2000-07. Leach still has a strong relationship with Kliff Kingsbury, who played quarterback for the WSU coach at Tech and was at the helm of the Red Raiders program until he got fired on Nov. 25. Nichol, a former Texas Tech wide receiver, was an assistant offensive line coach for Leach from 2003-05 while Holgorsen and Riley were in Lubbock. Most of Leach’s pupils still some variation of the Air Raid offense the coach designed with Hal Mumme 30 years ago. Oklahoma, West Virginia and Texas Tech all had top-20 scoring offenses this season, but each encountered some degree of difficulty putting points on the board in their game against ISU. The Sooners, who had the top offense in the nation at 49.7 points per game, were limited to 37 points – their second-lowest output of the season. The Mountaineers scored at least 35 points against 11 of their 12 opponents, but managed only 14 against ISU. The Red Raiders were good for 37 ppg this season, but fell short of that mark with 34 against the Cyclones. Buzzing a few old acquaintances can help, Leach believes, but the WSU coach isn’t relying on it. Published: Dec. 25, 2018, 5:39 p.m.